Everyone growing blueberries, blackberries, and raspberries should be monitoring for spotted wing Drosophila, a relatively new invasive pest that infests thin-skinned fruits as they ripen. For the past several years, this invasive insect has severely damaged these crops, making the fruits unusable. If you are seeing gross little white maggots in your garden raspberries right now, this may be the critter. According to the Home, Yard, & garden Pest Newsletter (hyg.ipm.illinois.edu), Spotted Wing Drosophila (SWD) is a destructive pest of thin-skinned fruits because unlike other fruit flies, it lays eggs into ripening fruit before the fruit is ready for harvest. Infested fruits "meltdown" from larval feeding and fungal rots in just a few days. Adult flies are tan with red eyes and a tiny 2-3 millimeters long (up to a one-eighth inch long). Males have characteristic dark spots on their wings that can easily be seen with a magnifying glass. Adults live for up to 2 weeks, and females can lay up to 300 eggs. Development from egg to adult can occur in as little as eight days, and 10 or more generations may occur within a season. The highest risk fruits include raspberries, blackberries, strawberries, cherries, nectarines, and blueberries. At moderate risk are peaches, grapes, pears, apples, and tomatoes. SWD can also build up populations on wild and cultivated plants with berries such as snowberry, elderberry, pokeweed, and dogwood. So what can you do now? 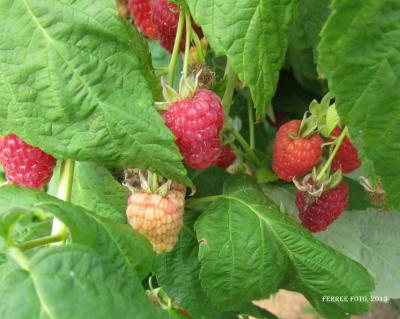 To minimize the build-up of populations remove and destroy overripe fruit and keep fruit harvested. Since SWD can also attack fruits of weedy plants such as pokeweed, remove these plants and/or their fruits. The tiny white maggot larvae will be feeding in the fruit even before harvest. To monitor the presence of the adults a simple trap can be made out of a clear plastic cup with numerous small holes and a lid and hung in the shade near raspberries. Apple cider vinegar is used as bait in the bottom of the cup, and yellow sticky traps keep the flies trapped until they can be identified. For more information about Spotted Wing Drosophila and constructing monitoring traps, consult this Michigan State University website devoted to it at http://www.ipm.msu.edu/invasive_species/spotted_wing_drosophila. For more information this and other plant pests and problems, contact your local Master Gardener HelpLine. The HelpLine serving Fulton, Mason, Peoria, and Tazewell counties is open Monday through Friday, 9 a.m. to noon by calling 309-685-3140 or emailing to uiemg-peoria@illinois.edu.